This adapter enables the connection of most IDE and SATA drives to PC/XT that have only 8-bit ISA slots. New Rev.3 boards now shipping! The Lo-tech 8-bit IDE Adapter is a bootable storage adapter for IBM PC, PC/XT, PC/AT and compatible hardware – essentially any PC with an ISA slot. The card enables the use of standard IDE (ATA) and SATA hard drives (via a SATA to IDE bridge). The BIOS ROM on the card enables the host PC to boot from storage presented by the adapter, which appears in DOS as an ordinary fixed disk (i.e. drive C, D, etc). No DOS drivers are needed. 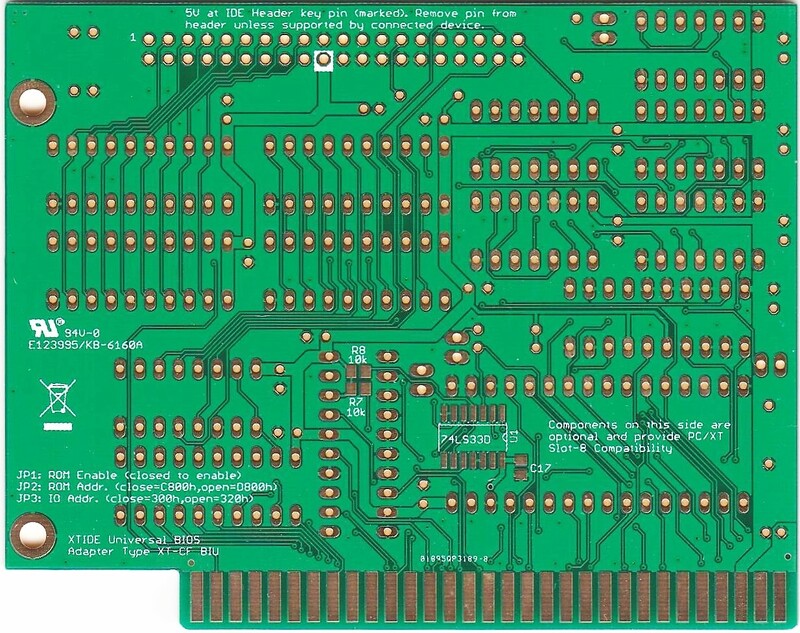 The PCB itself is a through-hole, 8-bit ISA adapter providing a 40-pin IDE header suitable for connection to one or two disk devices. Full details and bill of materials available in the wiki. Note: now updated to revision 3, compatible with Keystone 9202 ISA slot bracket and with selectable IO ports. ENIG finish. Easy assembly – requires only through-hole components to produce a working board. Note: PCB only. This product requires the separate purchase of components and home assembly; a soldering iron and solder are needed to assemble the adapter. 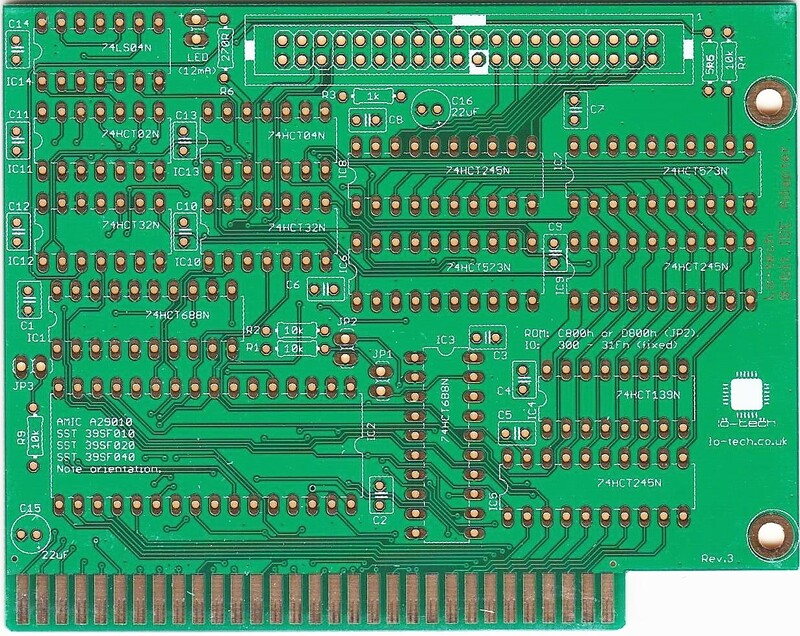 This board has over 300 holes to solder – for a simpler kit offering similar functionality, checkout the Lo-tech ISA CompactFlash Board. Images of assembled boards are provided for reference. I received this very quick in a large envelope through international mail. It was very straightforward to solder even though it required a lot of components. Luckily, the seller supplied a link to a list of the required components that allowed me to have everything prepared ahead of time. 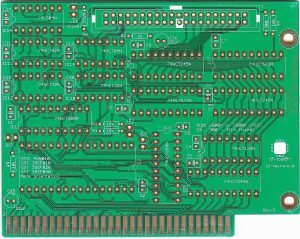 The PCB board itself is of the highest quality with the proper headings for where to place the components. It is hard to get a hold of an ISA bracket so I had to hold onto it while programming it but it programmed right away with the supplied utilities. Luckily, I will be getting a 3D printer soon in the mail so I can print an ISA bracket, then my little XT-IDE will be complete. I’m excited to finally get my IBM Model 25 up and running! Thank you lo-tech, you’re the best!